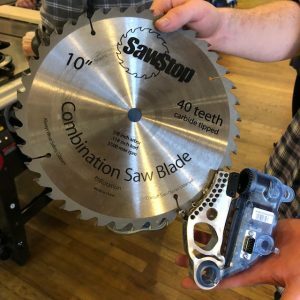 On Saturday, February 9th, we held a small demonstration of the SawStop brake system, which is responsible for the technology behind the quick shutdown of the SawStop Table Saw when it senses flesh. 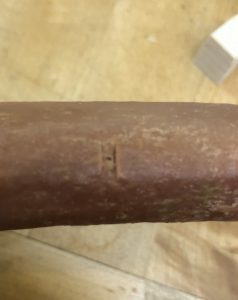 These demos are often done with hot dogs as they are the most similar to a human finger, though Roy Underhill once did one with a fried chicken drumstick. Highland employee, Jeff Dillon, performed the demo by first explaining the technology behind the brake system followed by the hot dog demonstration. He then pulled out the blade and brake cartridge to further show how the brake stops the blade when it comes into contact with flesh. The blade and brake cartridge. You will need to replace the brake cartridge and evaluate the condition of the blade for future use. 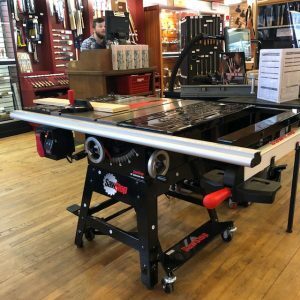 To find out more information about SawStop or to purchase your own saw, you can visit Highland Woodworking online or in-person.